You know what the Surgeon General would say if he saw you with them? I already got it Baby !!! Read it and Weep Boys, that`s 2 for me !!! Flip a coin for the next page? Be patient Tyler... You have a surprise coming.. The only pic I have. This is when I was installing them. Had to make a harness and brackets. 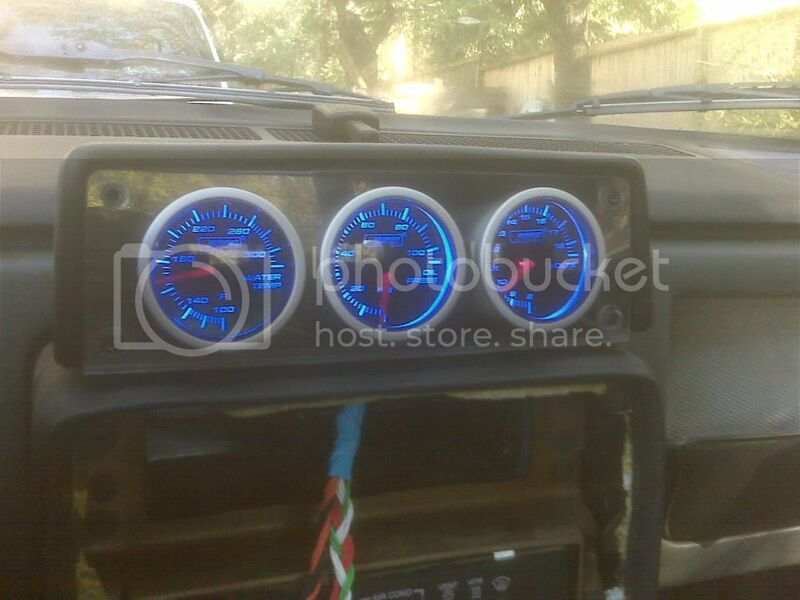 I will post my gauge cluster project when I get home. A good friends of Tylers' family, Tracy and her husband, have a really nice camper/trailer that sleeps 4-5 adults (2 queen beds and 2 twin beds) When I spoke with Tracy on the phone, she said they had it all winterized, covered up, and parked away for storage for the winter. They have pulled it out, got it all hooked up and ready to use for anyone going for the build. It has hot and cold running water, shower bathroom, central heat, TV ect... They are close to the build location. Someone needs to definitely take advantage of this, as they were nice enough to move it back out and get it all set to help out. This would be free of charge, and is a really nice gesture on their part to go through all the trouble. Contact Synthesis or myself, or call Tracy directly at 218 eight four nine 572 six. I would hate to have seen them go through all of the trouble of setting it up, and it was all for nothing. It would be like your own private vacation home for the weekend And FREE to boot!!!! they look very easy to install... might just be the ticket. when we meet to totally dismantel a fiero on saturday. Started a little early huh? I think those are designed to be drop in replacements for the stock gauges... Only problem is that everything is done custom- colors, tint, etc. It takes a while, unless he has some generic version kept away. A question/request for my greedy self. Anyone have a 1986 V6 auto ECU out there i could buy off ya? Most travel trailers nowdays are really quite a bit better than a generic motel room IMO, and that one sounds like a pretty nice setup. My brother has one that is similar, which he pulls from Little Rock, down to the beach on Bolivar Peninsula, and it is definitely a LOT more than "a trailer". It is very nice of Tracy and her husband to make this kind offer, and as I said earlier, the hospitality and generosity being offered by the people in the area around the build site is astounding. "I've got it here with me--come get it--I won't ship it." Wow, you guys make it sound like the travel trailer is a bad thing!!!!! This travel trailer, I can guarantee will be far nicer than any motel room that anyone is going to stay in there! No disrespect to the motels in the area, but a full kitchen, bathroom, living room, and 2 bedrooms is something you are not going to find at a motel anywhere! As MaryJane mentioned, it was EXTREMELY generous for them to set it all back up, and offer it to people coming into town, and sounds like an A+ place to sleep to me! I would have taken up on the offer, but I already booked a room, and do not want to back out of that arrangement out of respect to the people I am sharing the room with, or Robin. But my Uncle will provide free transportation for you to pick it up. Also, for those that have not checked out TylerToy.com, have a look. All of the photo's that I have found, as well as the news articles and all links pertaining to this project are also on there. Make sure to bookmark it as well if you are interested in watching the build progress. There will be a live camera and laptop at the site, so you will be able to watch, as well as chat with the people on site. There are 2 chat rooms actually, one with the video on the left, and one with just a chat room. (Both are the same chat room, so if one person is on one page, and another on the other page, they will be in the same chat). Thought I had better jump on here and clear up the travel trailer talks. We do have a travel trailer that someone is more than welcome to sleep in for free. It will comfortably sleep 2 not 4. I have not drained the rv anti freeze from it yet, as I was waiting to see if we have any takers before getting it set up. It does NOT have a tv set up in it right now. It is NOT a big luxurious travel home, just a simple small travel trailer. The beds will be clean and it will be warm, the furnace works great. I’m still undecided as to whether I will hook up the hose for the shower or not…we may have more trouble with freezing than what it’s worth. The camper would basically be provided for sleeping, and showering could be done in our home. The camper has a fridge (holds quite a bit of beer) J and there is a small oven and stovetop if you must cook, however I don’t see anyone having to cook at this event. We also have a guest room in our house that one or two guys are welcome to. I think that is where the confusion came in when Tracey said we had room for up to 4 guys. That is what we have to offer. If only one or two need a place to stay, we would rather they take the guest room, if more room is needed, then I will set up the camper. Please let me know asap if we have any takers so I can go ahead and set the camper up, it is really no big deal to do so, I am just waiting for definite plans so I don’t set it up for nothing….know what I mean? Also we live only about 6 miles from the shop, if someone does stay here and needs transportation back and forth, I’ll have it covered. Could also possibly pick someone up from the Fargo airport if that helps. Let me know what I can do, and keep in touch. Thank you for offering up some places to stay Barry! Barry, welcome to the forum. Personally, thank you for your hospitality! And I'm sure I speak for all of us when I say we don't drink beer. I RV'd for years with my family. As a matter of fact, we lived in our 34 foot Class A when we moved from Florida to MN. We traveled for 6 months in between the time we left Florida and the time we landed in MN. 6 people, 2 cats and a dog, crammed into a 34 foot RV led to some very interesting times... Especially when dad pulled the camper over cause he had to use the restroom... At the risk of too much information, all the windows opened at that point. Ahhh. The joys of RV living! Thank you so much for your offer of the travel trailer. I am sure we will find someone who can use it. Please, do not drain the storage antifreeze. If they need a shower, they can drive out to one of the hotel rooms, and we can accommodate them there for showers. 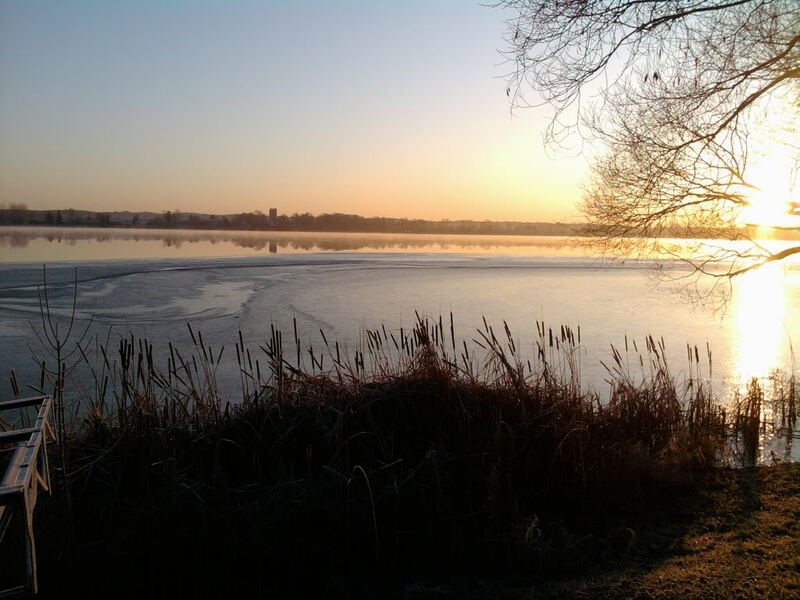 A think just a bed with some warmth to it will be more than suitable. Thanks so much for the warm welcomes! The members of this forum (and everyone involved in this project) are absolutely the greatest. It’s just fantastic what you are all doing for Tyler. He pretty much just lights up when this project gets mentioned. Knowing him, he’ll be there with his sleeves rolled up and wanting to get greasy. Lol As far as giving up a place for someone to crash, no problem. Just let me know if any, or how many, would like to stay, so I can start planning. By the way...I don't drink beer either. Ahhhh! That explains why you have an avatar from the 'cheesing' episode of South Park! You were cheesing, weren't you, Chris? It was supposed to be animated, but the animation failed.. "The goggles! They do nothing!" And yes, I was cheesing. You caught me..
Don't have the tools here to do so. Now back to your regularly scheduled programming. WE'RE GETTING CLOSER!!! 4 MORE DAYS!!! Of course...it matches my purse.......I mean....my guns. Lots of manly guns. "Be not led astray, bretheren beloved..." -James 1:16. Thanks, Danyel, for the graphic. Yes, that is the paint scheme we are going for on Ty's car. You don't like? After all the time and effort we put into getting the car ready, and the paint that Dave and Karen are putting on the car, and you don't like what we chose for Tyler?! I mean, come on! Sure, it will be a surprise to Tyler, but what man wouldn't love neon pink, green and flowers on their car? I bet a honda would still try to race it. 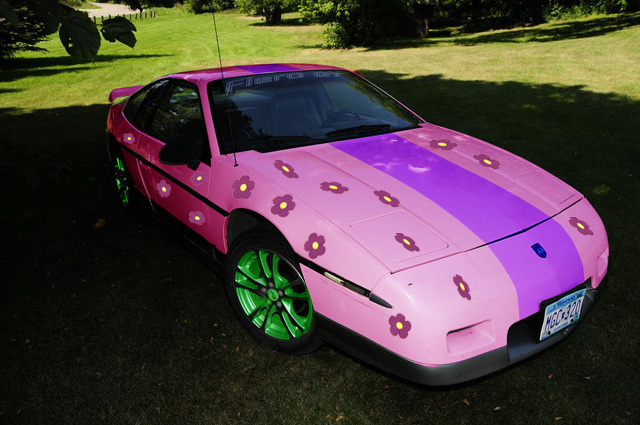 Imagine loosing to a pink fiero with green rims and flowers. That may be, but the digital dash takes a lot of time to get together, we don't have the money to put into a complete digital dash, and he doesn't sell enough in volume to make up for a full on donation. I am sure he would be willing to help out, but we are too close to the project for it to be within our purview.